The OnePlus 3 might be a bargain by flagship standards, but that doesn't mean it's not worth protecting. It's still an expensive and fairly fragile bit of kit, so keeping it in a case is well advised. 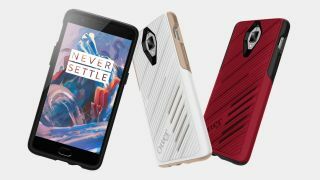 Sadly, the selection of cases for the OnePlus 3 doesn't come close to what you'll find for the iPhone 7 or Samsung Galaxy S7, but there are still a handful of very strong options. These include unusual materials straight from OnePlus itself, durable cases from big name manufacturers and a selection of budget covers. The following are five of the best. The best cases often do more than just protect your phone, they add new functionality too, like this case from J&D, which has a built-in kickstand, so you can prop your OnePlus 3 up on a table, desk, shelf, or any other flat surface you have to hand and use its 5.5-inch screen to watch movies without having to clutch the phone for the next 90 minutes. The J&D Kickstand case is durable too, it gives your phone a rugged look, but keeps it safe, and comes in a range of different colors. Don't let the name fool you, this case strictly uses PU leather rather than the real deal, but it looks convincing, giving your phone a stylish and premium finish at a low price. In fact, the BELK Leather Wallet is cheaper than a similar (and still not real leather) case made by OnePlus itself, so it's a bit of a bargain. As well as looking stylish the BELK case protects your OnePlus 3 of course, including keeping the screen fully covered with a magnetic clasp. It also has slots for your cards and can even be folded out into a stand. The downside of a case is that it covers up your phone, and while the OnePlus 3 isn't the most stylish handset on the planet it still has a premium appearance that trumps that of most cases. One partial solution to this problem is to use a transparent case, such as this one from Orzly. It's slim enough not to add much bulk to your phone and it lets the design shine through, while still providing some protection, thanks in large part to the impact-absorbing rim, which is available in a wide selection of colors. It's perhaps unsurprising that OnePlus itself makes some of the best and most unusual cases for its phone, and this bamboo case is a prime example. While not as protective as some, it will keep the back and sides of your OnePlus 3 safe from scratches, as well as providing a small amount of protection to the screen. But the best thing about this case is that it arguably improves the appearance of the OnePlus 3, replacing the standard back with a bamboo one, lined with Kevlar. It's an eye-catching look, and slim enough that it almost doesn't look like a case at all. If bamboo isn't your thing there are sandstone, Kevlar, rosewood and black apricot versions available too. If protection is your number one priority then you can't do much better than this OtterBox case. OtterBox has years of experience at making smartphone cases, and it shows with this, which sports a hard outer layer to defend against drops and scratches, coupled with a silicone inner layer that absorbs shocks. A grippy design ensures you won't accidentally fling your phone and while not the thinnest case around it's surprisingly slim for something so durable. These are ordered by price at the time of writing - however, some variation may occur over time!